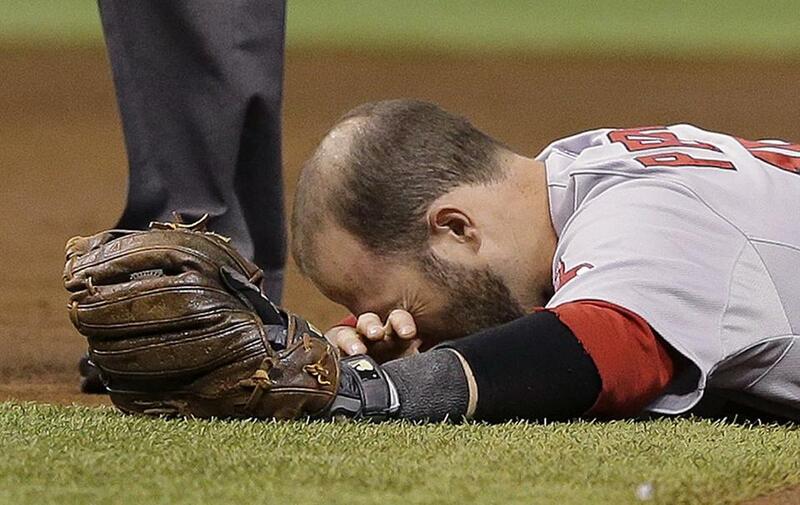 Dustin Pedroia sustained a concussion Saturday night, keeping him out of Sunday’s game. ST. PETERSBURG, Fla. — Dustin Pedroia sat out Sunday’s game against the Tampa Bay Rays while recovering from a concussion and will not play on Monday, according to Red Sox manager John Farrell. Dr. Cory Evans of the Rays checked Pedroia on Saturday. Follow-ups will be done. Because Pedroia suffered a head injury, only Major League Baseball can approve his return based on its established concussion protocol. Pedroia will be checked for fatigue, dizziness, and other symptoms. With rosters expanding Monday, the Red Sox will not place Pedroia on the seven-day concussion disabled list. Pedroia was injured during a play at second base in the second inning of Saturday night’s 7-0 loss against the Rays. As Tampa Bay’s Logan Forsythe dove for the base, his right elbow came up and struck Pedroia in the side of the head. Pedroia fell to the turf and stayed there for a minute before being guided off the field. Pedroia politely declined comment Sunday, but he was in good spirits based on his interactions with teammates. He watched the game from the dugout. The Red Sox have bowed to reason and will cut back on their usage of righthanders Junichi Tazawa and Koji Uehara for the remainder of the season. Uehara warmed Sunday but did not get in the game. He has not pitched since Monday. Tazawa last pitched on Wednesday. Counting the postseason, Tazawa has appeared in an MLB-leading 147 games over the last two seasons and Uehara 145. Both are showing the effects. Tazawa has a 4.32 ERA and 1.62 WHIP since July 27. Uehara has allowed seven runs on 10 hits over his last 3⅓ innings and four appearances. “We met. They understand the usage and how frequent it might be and also discussing and taking into account what’s taken place over the last couple of years,” Farrell said. Edward Mujica would serve as the closer on those days when Uehara is held out. Uehara said his understanding is that he would be used only in save situations and not in tie games. The Sox end the series with an afternoon game on Monday and will add righthander Steven Wright. Other roster additions will come later in the week. A third catcher, probably Dan Butler, will be added along with extra pitchers. Wright has appeared in one game for the Sox this season, allowing one run over four innings on Aug. 17 against Houston. He was 5-5 with a 3.41 ERA in 15 starts for Pawtucket. Righthanders Heath Hembree, Anthony Ranaudo, and Brandon Workman are good candidates for promotion, along with lefty Edwin Escobar. Ranaudo (3-0, 4.50) could start against the Yankees this week. Infielder Jemile Weeks was added to the roster and arrived on the bench in the third inning. The former first-round pick was acquired from Baltimore on Saturday night, along with infielder Ivan De Jesus, who was assigned to Pawtucket. The Sox sent infielder Kelly Johnson and Double A third baseman Michael Almanzar to the Orioles. Weeks was given No. 7, the same number Johnson had. It also was the same number Stephen Drew had before he was traded to the Yankees for Johnson on July 31. Farrell said Weeks would be used off the bench. In a span of 10 days, Will Middlebrooks twice saved the Red Sox from being no-hit and both times he came off the bench to do it. On Aug. 21 at Fenway Park, Yoenis Cespedes left the game against the Los Angeles Angels to attend to a family emergency. Middlebrooks replaced Cespedes in the lineup and doubled in the seventh inning for the team’s only hit. On Saturday, Middlebrooks replaced Pedroia and singled in the fourth inning for the team’s lone hit. According to the Elias Sports Bureau, only twice in the last 114 seasons did a Red Sox player come off the bench to get the team’s only hit in a game. Duffy Lewis did it on July 13, 1917, against the Tigers. Carl Everett singled with two outs in the ninth inning against Mike Mussina of the Yankees to break up a perfect game on Sept. 2, 2001. The Sox have been held to one hit three times this season. That last happened in 1992. The Red Sox and Yankees were each held to one hit on Saturday. That had not happened since 1989. Allen Craig was out of the lineup for the third time in eight games as Farrell continues to give playing time to Daniel Nava. “We’re trying to fit everybody in as best we can,” Farrell said . . . David Ortiz extended his on-base streak to 15 games when he drew a walk in the first inning . . . Brock Holt stole second in the fifth inning, giving the Red Sox 20 steals in their last 21 attempts. They were 29 of 49 (59 percent) before that . . . Xander Bogaerts, who had one hit in his previous 29 at-bats, was 2 for 4 with a double and a run scored . . . Henry Owens (3-1) struck out nine in six innings as the PawSox beat visiting Rochester, 10-4, to clinch the International League’s wild-card spot. Pawtucket (79-64) is in the playoffs for the fourth straight season and will play Syracuse in a best-of-five series starting Wednesday at McCoy Stadium.